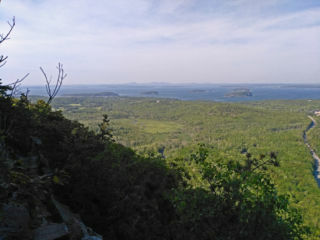 View of the porcupines from Dorr Mtn. The Schiff Path has lots of steps, but it probably the easiest of the hikes to do. 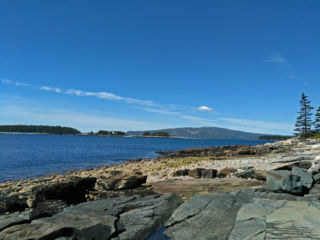 With stunning views of Frenchman’s Bay, this is our favorite hike for Dorr. The Ladder Trail is a vertical trail that heads straight up the east face of the mountain. It’s less exposed than the Precipice and Beehive, but still fun, and Dorr is a much larger mountain than Champlain (Precipice) and the Beehive are. The Ladder Trail, or the East Face Trail, connect to the Schiff Path for the hike to the summit. The North Ridge Trail starts around the Sieur du Mont Springs area and the Jesup Trail. It can be linked from the Kebo Mountain Trail, and for a long day is walkable from the Mira Monte Inn. 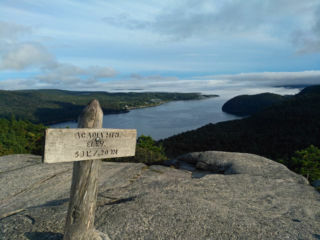 The South Ridge Trail is a long hike that connects to the Canon Brook Trail or the Gorge to the east (not to be confused with the Gorge Path – see below). One can head down the South Ridge and take a left on the Canon Path back to the parking lot, or turn right toward Canon Brook and it’s wonderful waterfall. If going to Canon Brook, take the A. Murray Young Path back up the western side of Dorr. This is a long loop that summits Dorr twice, but is well worth it. The Gorge Path, on the western side of the mountain, is usually used to hike Cadillac Mtn., but there’s no reason to avoid it going up Dorr. The A. Murray Young Trail heads down the western and southern ends of the mountain near Canon Brook (see South Ridge Trail above). To get more local advice such as this, book now to reserve your seat at the breakfast table at Miramonte.com! The boardwalk on the Jesup Trail. Sometimes the park is furiously busy. I’ve been in a car on the Park Loop Road, just past the Precipice parking lot before the toll booths, that has taken over 1.5 hours to get to Sand Beach. That’s less than a mile in that time. 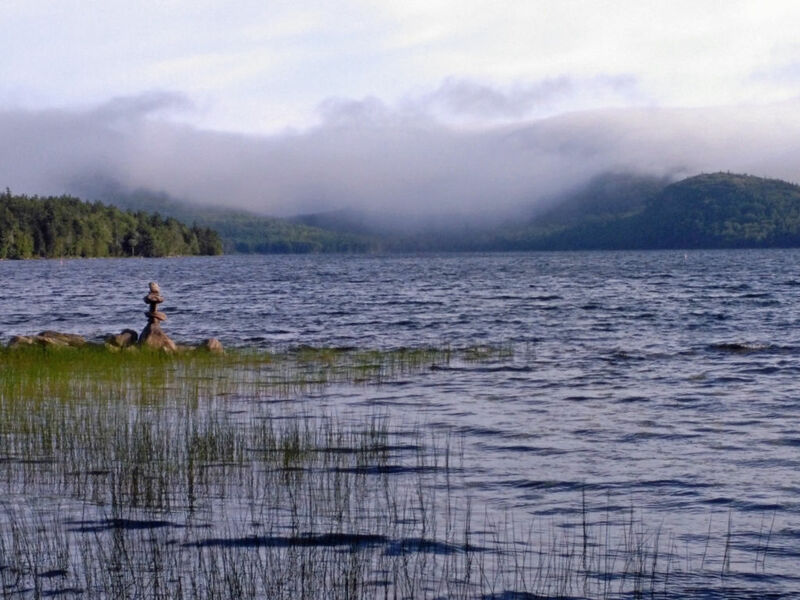 Yes, Acadia is magical, and it is one of the most beautiful parks in the United States, but at times the hot spots can get crowded and parking can be next to impossible. That’s why we at the Mira Monte Inn have a few trails that we can recommend where one can leave the car at the Mira Monte and hike straight from the front porch. The Jesup Trail is one of those hikes. As you can see from the photo, I walk my dog out here quite a bit. From the Mira Monte, out to Sieur de Mont Springs and back, the hike is about 1.5 hours and is mostly flat. One also gets to walk on the Great Meadow Loop enroute. 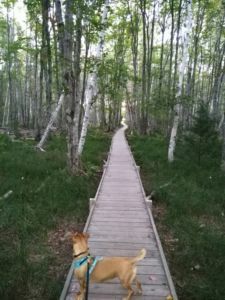 And if you want to make things a bit longer, you can add other loops such as the Hemlock Trail, the Strathden Path, and even Kebo Brook and Kebo Mountain. 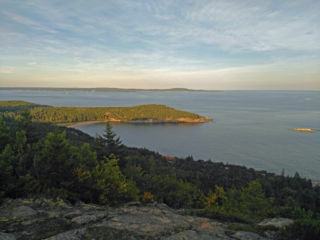 For more serious hikers, the Gorge Trail and therefore Cadillac Mountain and Door Mountain are also accessible off the same system of trails. The Great Meadow Loop alone is about an hour, so there’s a shorter option if that fits your itinerary better. To get to the Jesup Trail from the Inn, walk across the street to Spring Street and follow that straight, keeping the kiddie pool at Glen Mary to your left, out to Ledgelawn Cemetery. From there, look diagonally right across the street and you’ll see the start of the Great Meadow Loop. 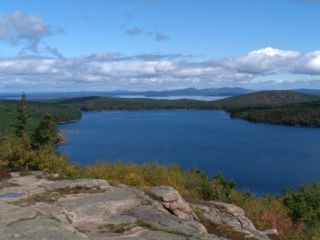 Most of the Great Meadow Loop is on private land, but that’s OK as it is designated as a hike in the area. Follow that around eventually to the left where you’ll walk along the road a little bit near Kebo Valley Golf Course. The path picks up a bit down the road near the Holy Redeemer Cemetery. 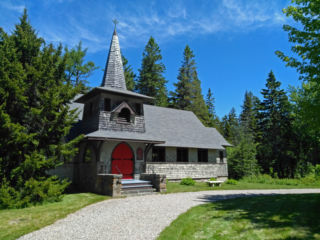 Actually, at the Holy Redeemer Cemetery you’ll see access to the Strathden, Kebo Brook and Mountain, and Gorge Trails, so you can do that if that’s your wish. To head to the Jesup Trail, keep going up the path that follows the road. At the Park Loop Road, stay left on the Great Meadow Loop until you come to the Jesup Trail sign post. Cross the Park Loop Road and you’re there. To come back, either re-trace your steps, or follow the Great Meadow Loop around, eventually ending up on the other side of Ledgelawn Cemetery. There’s even a nice rocky brook to soak your feet in near the end of the hike. Pandora, the pup in the picture, uses that as a must-stop drinking spot. Do this hike at dusk and there’s a high likelihood you’ll spot some deer. To get us to repeat these directions in person, check our availability calendar here. Looking for some thing easy but has length? I walk my dog around the Eagle Lake carriage trails every now and again, and she’s often quite ready to eat dinner and go to sleep afterward. 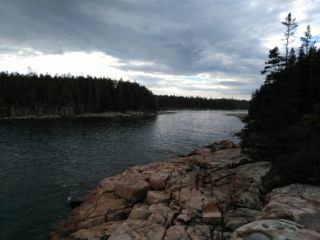 A solid two-hour hike, this is one of those “walks” that will give you exercise without hurting the ankles or knees. Parking can be found at either the boat launch area or across the street at the bottom of the McFarland’s Hill (the top of which houses the park’s headquarters). A couple of tips are needed here. The first is that the Eagle Lake parking lots are notoriously difficult to navigate during the busy season. It’s not uncommon to find cars parked along the side of the road all the way up Route 133 (the Eagle Lake Rd, as locals call it). Most of those parked there during the day are bikers out enjoying the 50+ miles of carriage trails that are available to them without having the worry of passing cars. If you get there at a busy time, don’t be bothered by the quantity of cars. The carriage trails are both wide enough and spaced out enough across the park to allow the area to not feel crowded. However, if you want to beat the crowds then the best times to hike are 8am or after 5pm. If you’re hiking later in the season then a headlamp might be helpful, even if the road is pretty easy to follow in the dark. Another healthy tip is knowing what you’re getting into if you decide to take the hiking trail at the southern end of the carriage trail. It might look as if it’ll save you time, but in fact, despite it being a shorter distance across the edge of the lake than the rounding carriage trail, it is actually quite a bit more difficult to walk. 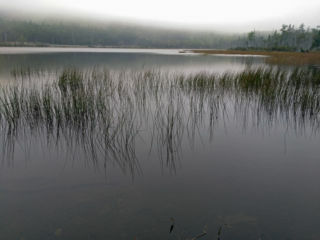 There are many good trails around the southern end of Eagle Lake (Connor’s Nubble, North and South Bubble, etc. 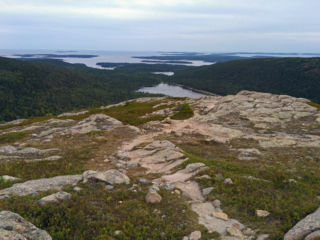 ), but the Eagle Lake Trail is very rocky with lots of unbalanced and precarious steps. I made the mistake of doing it once with my dog, and I’ll never do that again. It’s way too easy to lose one’s balance. If you’re looking for a surprisingly challenging hike, then this is a wonderful trail. But if you’re just looking for some exercise, stay on the carriage trails and get your heart rate up by setting a good pace. There’s still some good views and lovely hiking to be had. If you’d like some more tips, we’d love to have you stay with us. Click this link to check availability: Mira Monte Booking Calendar.